I’m here with another installment of ‘What the Kids Read’ and this month we have been reading so much more than usual (which is a lot anyway) as Athena now has school books to read. 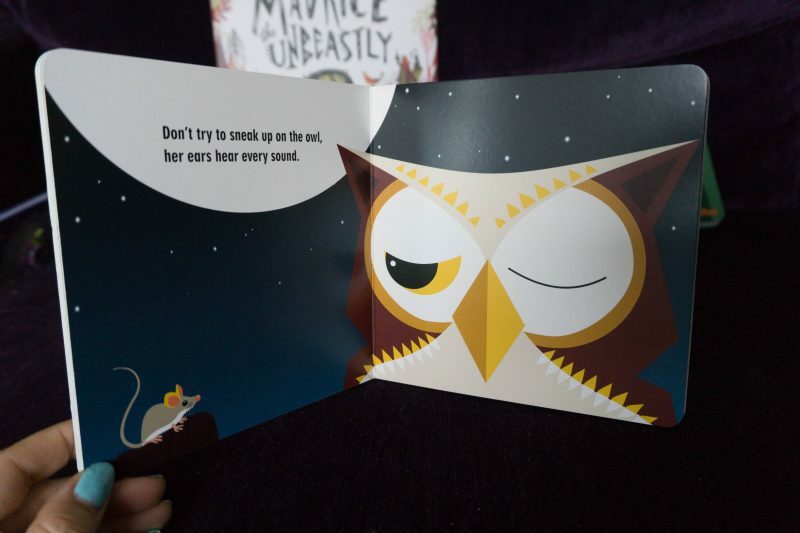 However, said school books are dull as dishwater, so we need to spice things up on the literary front with fun books! I get why they have to be repetitive, short and use specific words as she’s learning to read but it’s not that inspiring I must say! 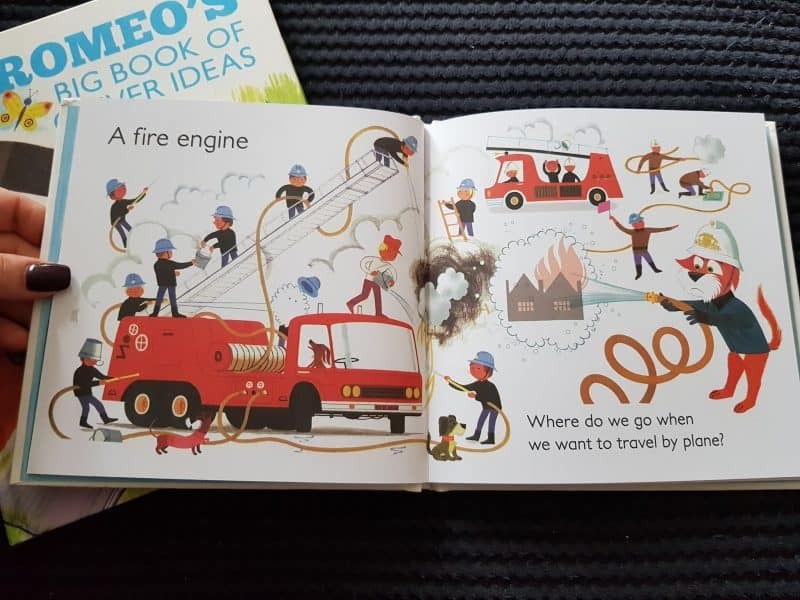 I’m glad though that we not only have shelves of kids books already but that we get fun new books sent to review too, definitely a huge perk of having a parenting blog! This months favourites features Athena’s two current favourites, three of Arlos’ and one they both love. 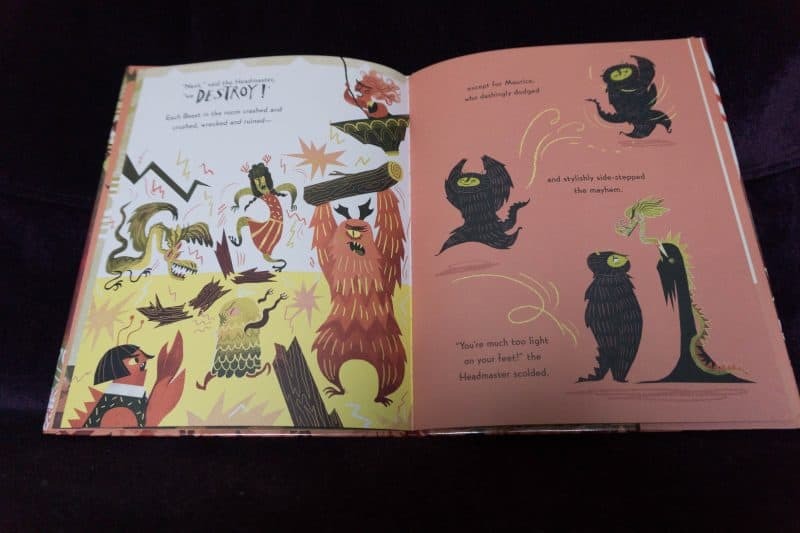 First up is Maurice the Unbeastly, which the loveliest story about a little beastie that is just too nice, so nice and un-beast like that he doesn’t fit in at the ‘Abominable Academy’ that his parents send him too to beast him up a bit! He just can’t get his head round being beastly at all, which he was a bit upset about! Thankfully in the end Maurice finds something he is really good at, an d gets a special accolade from the head teacher, even though he was not like the other beasties at all! I think Athena loves this as it’s about starting school, which is something she has just gone through of course. 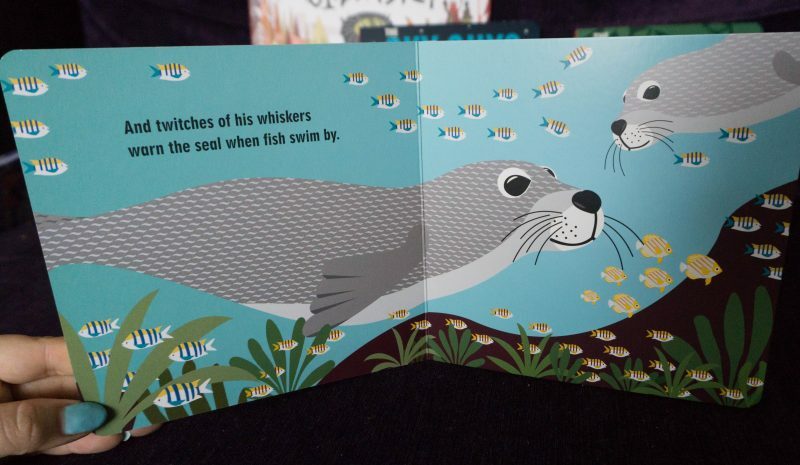 She also loved the imagery, the book is full of gorgeous illustrations and each page has a lot to look at, which makes it Arlo-friendly too despite being a little longer than he would normally sit through. It’s by Amy Dixon, and is available here on amazon. 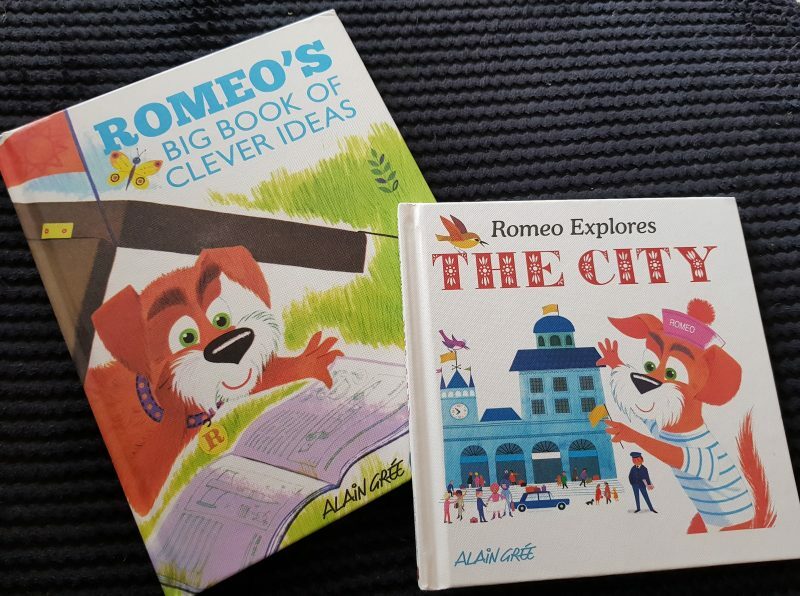 Next up for Athena is Alain Grée’s ‘Romeo’s Big Book of Clever Ideas‘, which she loves because she’s a bit dog obsessed, and she LOVES camping too! This story is about a little dog who packs too much in his case for a camping and can’t lift it! He heads to the library to get a book of clever ideas, and tries all sorts of weird and wonderful ways to transport his case! It’s a decent length book, with the classic illustration that Alain Gree is known for. 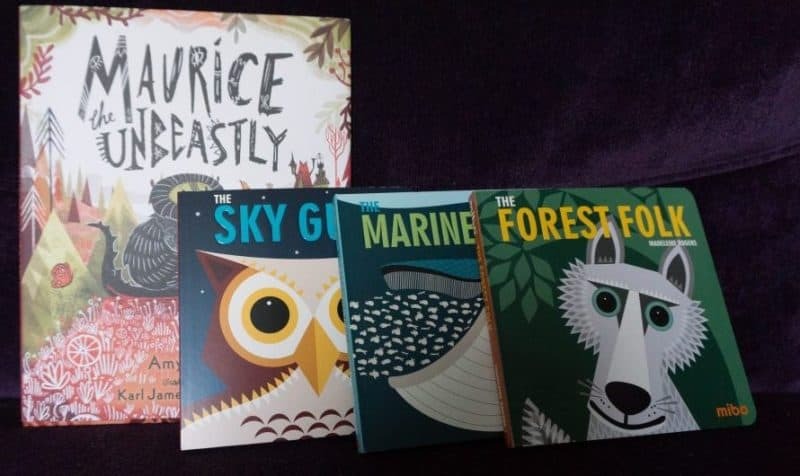 Arlo’s favourites are the new Mibo board books; Sky Guys, Forest Folk and The Marine Team. 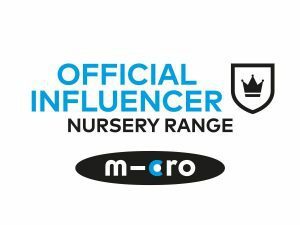 We’re already big fans of the Mibo series so it was great to expand our collection! Arlo still needs to be carefully supervised around proper books, but even he has never managed to destroy a board book! When I am helping Athena with her school books or writing it’s nice to be able to give him some books to keep himself occupied on his own for a while! I also love to keep board books in the car and my changing bag for when I need some fast and easy entertainment on the go! These three are lovely books, full of animals and birds to look at – Arlo’s favourite things after cars! The last book that we all love to read together is another Alain Grée book called Romeo Explores the City, Each page asks a question, and the answer can be found on the following page, helped with clues. There are so many lovely pictures to look and and conversation starters on each page. You’re taken on a little adventure round a city with Romeo the Dog. This is the first time these books have been published in English too. All these books are review copies but words and opinions are my own. Post contains affiliate links, it doesn't change the price you pay but I get a couple of pennies per sale.